After the Competent Communicator manual is done, what’s next in Toastmasters? Why should you stay? Are you done? We’ve got a lot more to offer you. After about a year in Toastmasters as you complete your Competent Communicator manual, you might be wondering what’s next. Is the CC all that Toastmasters has to offer you? You may hear some older Toastmasters say that you shouldn’t go too fast through the Competent Communicator manual. They have a valid point: the longer you’re in Toastmasters, the more speeches and more evaluations you’ll see and learn from. I strongly believe that you learn more about your speaking from the evaluations you give others. If you rush through the CC, you are depriving yourself of a lot of learning. But the great value of Toastmasters is that you work at your own speed. If you can get through the CC in a few months and are comfortable doing so, don’t let me stop you! When you finish the CC, you’re not done with what Toastmasters offers. We’ve got a lot more for you to learn. If you joined Toastmasters because your boss told you to, was it because you’re going to be giving presentations of material related to work? I’d recommend you take a look at the Better Speaker and Successful Club series of speeches. They are available for free by download on the Toastmasters.org site. Let me acknowledge that I commonly refer to these speeches as “zombie” speeches. In the past, TI gave you the slides and a script – thus, a zombie could do these. They were… terrible. Horrible. Important information for speakers or for clubs to be successful, but the format was less than stellar. In the last few years, I believe that TI learned that these speeches had to be customized for the speaker. So now they give you an outline of the material (you could probably still find the slides somewhere but DON’T!) and let you create a speech that suits your style and your audience. Toastmasters even has a standard template for Powerpoint presentations for you to use if you like. You can check out their branding information here. I think that these speeches can teach you how to take someone else’s material and make it your own. In the business world, that skill alone can be vital to your career! We do have another series, the Leadership Excellence Series, which focuses more on leadership than communication. These have more application outside Toastmasters. Looking to improve your skills in a specific way? Look at our Advanced Manual series. We have 15 manuals with 5 projects each that focus on different aspects of public speaking. Check out this link to a district’s examination of each of the manuals where you’ll find all of them with a list of the projects inside. You buy the manuals from Toastmasters.org – but wait until you get the freebie coupon when you get your Competent Communicator Certificate in the mail. You get two manuals for free! Take advantage of this! Consider an Advanced Club. These clubs have a membership requirement that requires a certain number of speeches be completed before you can join. The Toastmasters in these clubs are often looking for deeper, more insightful evaluations and longer presentation times. Since some of the advanced manual speeches are longer than the average 5 to 7 minute projects, these clubs tend to hold longer meetings but only meet monthly. They are worth your time if you want to move up in Toastmasters. You’ll hear people stick letters after their names… CC, CL, ALB, ACG, DTM. Those letters indicate how far the member has gone through the Education tracks. We have several award levels split between two tracks: Education and Leadership. Each award has a set of requirements that you can find on the Toastmasters site. When you finish your Competent Communicator manual, you can put CC after your name too. Finish the CL and you add it “CC, CL” and so on all the way up to DTM: Distinguished Toastmaster, the highest award we give. Don’t think that it’s a simple or easy process. A rough estimate shows that the DTM award is granted after some 7 hours of on-stage presentations and at least 1.5 years of officer service to a club and the district. This is a challenging course and, in my opinion, the equivalent of a masters degree in practical communication. Like the Boy Scouts’ Eagle Scout award, very few people do achieve it. The estimates run between 2% and 6% of members achieve this. 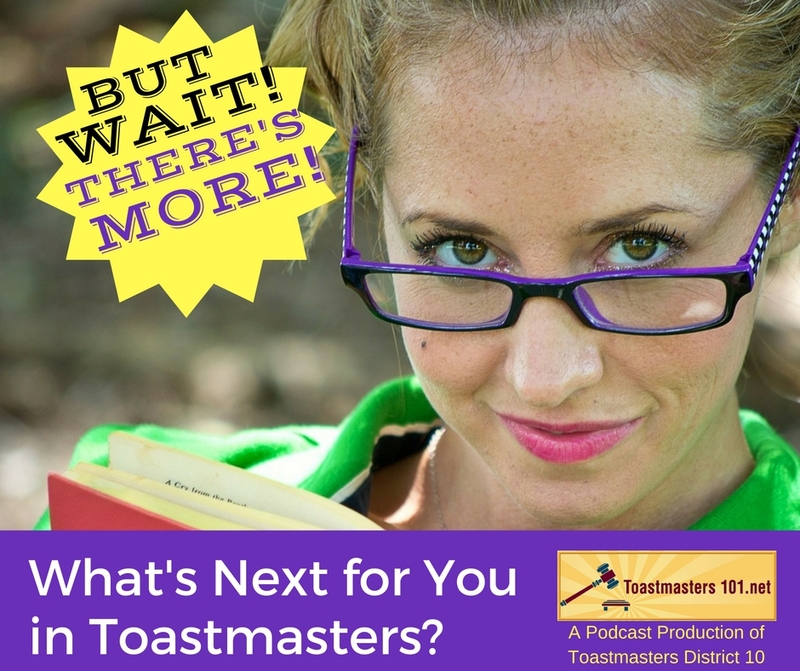 You don’t have to be done with Toastmasters. We want you to stay. Your experience will help new Toastmasters and yourself to improve. Stick around. There’s more to come. Author Kim KrajciPosted on December 4, 2016 February 25, 2019 Categories ToastmastersTags advanced clubs, advanced manuals, competent communicator, Leadership, What's next?